So you’re finally taking the plunge, you’re going to book your first family ski holiday! It’s sure to be an incredible experience, but there are a few aspects you need to research carefully before simply going ahead and booking your trip. Travel plans, accommodation, tour operator, all of these are important to consider. However, it’s choosing the right family-friendly ski resort that can really make the difference to your holiday. With a family ski holiday, you are after a ski resort that has it all. Beginner-friendly but with enough challenging terrain for more advanced skiers in the group, a beautiful charming Alpine town with a number of entertaining off-slope activities, a good snow record with easy access from the UK… It can sometimes seem like you are searching for the unattainable holy grail of ski resorts. 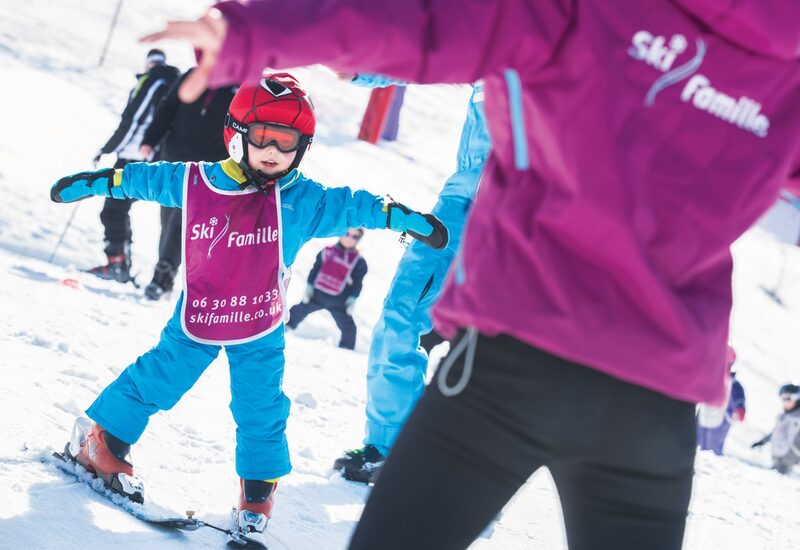 However there’s no need to worry – we’ve scoured our extensive resort guide to bring you the best options for your family ski holiday. Let’s face it, there’s a reason that the huge ski areas of the 3 Vallées, the Portes du Soleil and Paradiski are so popular. With a wide variety of slopes and high altitude meaning a reliable snow record, resorts in these areas are often sought after by families. Some resorts in these areas, such as Val Thorens, Les Arcs or Avoriaz, are more frequented by younger people and students, who flock there thanks to the lively après-ski scene, cheap accommodation and consistent snow. However, as a family, it is likely you will be looking for a resort with more charm and ambience, something a bit smaller and with more character. This is where resorts such as Les Gets, La Plagne and Les Menuires really come in to their own. With easy access to huge ski areas, these resorts offer a much more family-friendly base for those after a little more peace and quiet. Let’s take Les Menuires and the surrounding resorts of Reberty 2000 and Les Bruyeres for example. Les Menuires has often been thought of as one of the best family resorts in Europe, with a high altitude location that boasts exceptional snow quality year on year. With easy access to the 600km 3 Vallées ski area, these resorts offer charming hamlet style accommodation in unparalleled locations right on the pistes. Incredible mountain views, brilliant chalet facilities and a number of nearby beginner’s slopes… it’s a family paradise. When travelling with children, the last thing you want is a lengthy journey, with hours spent crawling up winding roads in a cramped coach. This is why it’s a good idea to consider a resort with a quick flight time (from bases across the UK) as well as an easy direct transfer from airport to resort. Les Gets, for example, is the perfect resort for this. 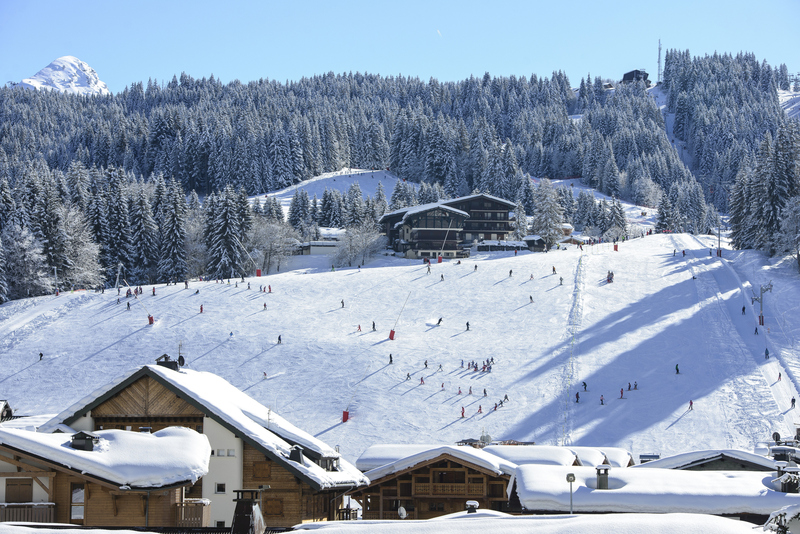 Located in the huge Portes du Soleil area, it also offers skiers of all abilities the opportunity to enjoy themselves on the area’s gorgeous wooded slopes. Whether you are experts taking on the area’s challenging black runs, children enjoying the fun zones or freestyle fans practicing their skills in one of the parks, all the family are sure to enjoy skiing here. It’s not just important that the resort is easily accessible from the UK. You’ve also got to consider ease of access to the slopes. Long walks to the lifts with youngsters carrying skis and poles? No thank you! Even a shuttle bus journey can be stressful when you have a number of youngsters in tow. Therefore, it’s best for you to choose a resort with a number of ski-in ski-out accommodation options that have direct access to the slopes. Ski Famille offer these properties in all of their resorts, of which there are many across the Alps. However, you also need an area that has enough beginner-friendly runs to keep budding young skiers entertained. A good variety of blue and green runs is essential for young skiers looking to find their feet, so you want an area such as Les Menuires or Les Gets, where a number of gentle runs are easily accessible from the town. What’s more, many resorts these days have dedicated children’s slopes, beginner areas and fun zones, all of which are sure to intensify the joy of skiing for youngsters, so it’s a good idea to check out what the ski area you are considering has to offer. For anyone looking to learn to ski, a good ski school is of the utmost importance. Highly qualified instructors are, of course, a must, but for English speaking beginners (especially children) it’s also highly important to have an instructor that is fluent in your language. There’s nothing worse than a breakdown in communication when you’re at the top of the slope and everyone else has easily made it to the bottom! As anyone with children will know, they have a LOT of energy, which sometimes even not a long day on the slopes can abate. Therefore, it’s important to find a resort that has a good range of family-friendly activities off the slopes. Whether it’s the unique experience of night skiing, adrenaline inducing toboggan runs, husky sledding, piste-basher rides or ice skating, many resorts offer almost as much off the slopes as on them. Of course, we all know children particularly enjoy the festive period so resorts like Les Gets are perfect for a Christmas getaway, with the opportunity to visit Santa’s incredible forest grotto, a magical experience filled with Christmas elves, activities and of course, the big man himself. Who knew Santa lived in Les Gets!? Finally, you want a resort that will capture children’s imaginations – you want their first Alpine experience to be truly magical, with a charming traditional chocolate-box type resort that boasts all of the above elements. Les Gets has got to be one of our favourites in this respect, with a beautiful pedestrianised centre and local ambience. Younger children are sure to enjoy the charming traditional Alpine feel of the town, with its large main square, open air ice rink and vintage carousel. Meanwhile, Plagne 1800 manages to maintain the perfect balance of traditional Savoyard atmosphere, high altitude skiing and fantastic slope side locations, within the 425km of the Paradiski area.